Every year, millions of people with knee pain undergo painful and expensive total knee replacement surgeries, or subject themselves to the risk of high dose epidural steroid injections. Frequently, surgery does not help their original pain, and they are left with other chronic pain conditions and frequent surgical replacements. Those who choose steroid injections ocasionally experience minimal short term relief, but expose themselves to serious longer term side effects. Bone marrow derived stem cell therapy offers an exciting option for relief from debilitating knee pain. Avoid surgery and pain medications with this minimally-invasive treatment. Read this article by one of our Board Certified Orthopedic Surgeons demonstrating how mesenchymal stem cell knee injections can be an effective treatment for to delay or completely avoid knee replacement surgery. term relief, but expose themselves to serious longer term side effects. Bone marrow-derived autologous stem cell therapy offers an exciting option for relief from knee pain and injury. 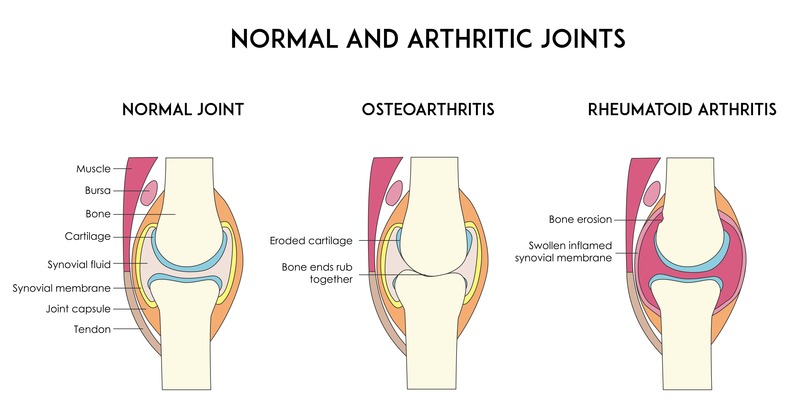 Osteoarthritis – the most common form. Progressive inflammation slowly deteriorates the cartilage and damages the bones in the knee. Eventually the knee bones will rub together, resulting in pain, swelling, stiffness, and a decreased ability to move. Rheumatoid Arthritis – an autoimmune disease which causes inflammation as the body’s immune system starts attacking the joints. Post-traumatic Arthritis – occurs due to an injury (such as a fracture, a torn ligament, or a torn meniscus). While there is no cure for arthritis, there are a number of treatments to help ease the pain and reduce the chances of it becoming worse. A knee brace is often used to stabilize the kneecap and help it move correctly. Painkillers (analgesics) and anti-inflammatory medicines are also used for relief of symptoms. Steroid injections are sometimes given directly into a particularly painful knee joint and will usually last for several weeks or months. Knee replacement surgery is a treatment when all other options have failed. Stem cell therapy now offers patients a minimally invasive option for healing with little to no rehabilitation. It has been demonstrated to induce profound healing activity for various forms of arthritis. Over-stretching or tearing of the anterior cruciate ligament (ACL) in the knee causes injury. ACL sprains usually occur due to a sudden change in direction, a sudden stop, incorrect landing after a jump or a direct impact to the outside of the knee or lower leg. Severe injuries result in a complete tear of the ACL. Stem cell injections offer an alternative to ACL surgeries by helping the ligament tissue repair itself at the site of the original tear. Stems cells have a unique ability to replicate themselves, as well as to differentiate. “Differentiate” means that the stem cells can turn themselves into the type of cell present in the injured body part, even if the stem cells come from another part of the body. The nature of the injury determines how successful the injection therapy will be. A baker’s cyst is also called popliteal cyst. Arthritis or a knee injury can result in excess synovial fluid being pushed into a small pocket of tissue behind the knee. Usually, a Baker’s cyst is not associated with pain. In some cases, minor pain radiates towards the upper calf. Pain is usually felt when the knee is bent all the way or straightened. Sometimes, there is swelling, tightness and stiffness behind the knee. Rupture of the sac of liquid (cyst) and subsequent draining can cause swelling and redness in the lower leg. A Baker’s cyst may go away on its own. However, if another condition like arthritis is causing the cyst to form, then the physician may recommend treating that specific condition so as to alleviate pain and swelling. The physician may order additional imaging tests (X-ray, MRI or ultrasound testing), because these symptoms are very similar to those seen in more serious conditions such as blood clots, aneurysms, or tumors. Talk to our doctors about stem cells can be used to reduce Baker’s Cysts. The main function of the biceps femoris tendon is to facilitate bending of the knee and extending the hip. It is located in the lower portion of the hamstring muscle that attaches directly to the back of the knee. Small tears develop due to overuse from activities like excessive jumping and running. This is in turn leads to scar tissue and adhesions making the tendon tighter and thicker and causing a pulling sensation at the insertion point of the tendons. Many people with biceps femoris insertional tendinopathy do not want to resort to surgery or risk the side effects associated with steroid injections, so an easier, safer alternative may be the injection of one’s own stem cells to treat the injury and essentially regrow the damaged tissue. Most commonly seen in athletes, it is the inflammation of the hamstring tendon as it attaches to the top of the back of the thigh. It usually occurs after a tear to the hamstring due to overuse. Pain is most likely to be felt when stretching the hamstring muscles. Regenerative treatment utilizing stem cell injections can be a more effective alternative to treat this syndrome. Usually an injury to the ligament can result in the sensation of the knee giving out. The two sides of the joint might not be held together tightly due to injury to one or more ligaments. Typically, twisting or side-to-side movements can cause instability. A knee effusion (or swelling) can also contribute to knee instability by artificially increasing the space between the femur, tibia, and patella. Torn tissue may be allowed to rebuild itself after injection of stem cells, significantly decreasing risk of open surgery and the pain associated with it. The lateral collateral ligament, or lcl, is the thin band of tissue running along the outside of the knee that connects the thighbone to the fibula. Like the MCL, the lateral collateral ligament’s main function is to keep the knee stable as it moves through its full arc of motion. The main cause of LCL injuries is direct force to the inside of the knee. This puts pressure on the outside of the knee and causes the ligament to stretch or tear. Stem cell therapy can be an effective therapy that may regenerate the ligament and stimulate healing of the original ligament rather than surgically replacing it. The MCL, or medial collateral ligament, is the band of tissue on the inside of your knee that connects your thighbone to the bone of your lower leg and keeps the knee from bending inward. This ligament can be stretched or torn to the point where the knee joint becomes unstable. 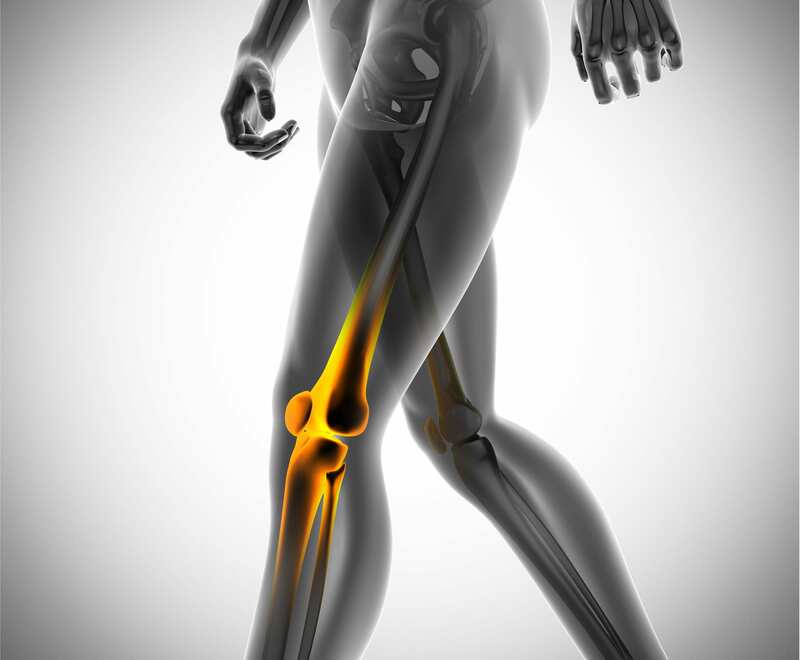 Injuries to the MCL are usually caused by a force that pushes the knee sideways. These are often contact injuries, but can also occur while doing activities with lots of stop-and-go movements, jumping, or weaving. On average, it takes about six weeks for an MCL injury to heal. Stem cell regenerative treatments offer a non-invasive option allowing the patient to avoid the painful period of downtime and rehabilitation. A meniscus tear is among the most common knee injuries, in which forceful twisting or hyper-flexing causes certain tissues in the knee to tear. Because other knee problems cause similar symptoms, your doctor may order x-rays or MRIs to help confirm the diagnosis. As a safe alternative to surgery, stem cell therapy may be used to regenerate the torn tissue with a virtually painless injection. Patellar tendonitis refers to inflammation of the tendon that connects the kneecap to the shinbone. also known as jumper’s knee, the injury is most common among athletes whose sports involve repetitive jumping, running, or bending their knees. Patellar tendonitis is an overuse injury resulting from repeated stress on the patellar tendon. The repeated stress creates small tears in the tendon, which the body will begin to repair. As the tears begin to multiply, they cause pain due to inflammation and weakening of the tendon. If the damaged tendon continues to tear, the injury will eventually lead to tendinopathy. The pain may initially be felt at the start of physical activity or after a particularly intense workout. As the injury progresses, the pain may be present while walking up stairs, rising from a chair, or performing other such daily activities. Aside from engaging in repetitive physical activities, other factors that can lead to tendonitis in the knee are muscular imbalance in the legs, tight hamstring muscles, and new running shoes. Diagnosis of this condition will typically involve a physical examination and imaging tests. because pain from patellar tendonitis resides on the front of the knee (just below the kneecap), the physician will apply pressure to parts of the knee in order to determine where the pain is most prevalent. For some patients, minimally-invasive adult stem cell therapy may be a much less debilitating alternative to surgery . Patellofemoral pain syndrome, one of the most common causes of chronic knee pain, results from degeneration of cartilage due to poor alignment of the kneecap as it slides over the thighbone. this condition is also known as chondromalacia patella or “runner’s knee”. Patellofemoral pain syndrome most commonly occurs in teenagers, manual laborers, and athletes. There are a number of things that can cause improper alignment of the kneecap. Diagnosis of patellofemoral pain syndrome will typically involve a physical exam and medical history. at times, an MRI or x-ray may be done in order to rule out any damage to the structure of the knee. For some patients, minimally-invasive adult stem cell therapy may be a much less debilitating alternative to surgery for this condition. The posterior cruciate ligament, or the PCL, keeps the tibia from moving backwards too far. PCL injuries are not as common as an injury to the ACL and are often due to a blow to the knee while it’s bent. More often than not, the injury is a result from a trip or a fall, but is known to happen during automobile accidents or contact sports. When the PCL is sprained or torn, the patient will start to notice some pain, swelling, and a feeling of instability. Often times, the signs and symptoms can be so mild that you might not even notice anything wrong. Although, over a period of time, a PCL tear can lead to osteoarthritis. As with the other ligament tears, regeneration of the tissue has been successful in some cases through stem cell therapy. Most common among young athletes, pes anserine bursitis occurs when constant friction on the bursa sac causes it to become inflamed. when irritated, it produces too much fluid, causing it to swell and put pressure on the adjacent parts of the knee. Stem cell therapy has been shown to be effective in reducing inflammation in these situations. Discover the incredible potential for healing contained in your OWN stem cells! Mesenchymal stem cells can repair and replace degenerative areas in damaged joints and provides your body the opportunity for natural healing.